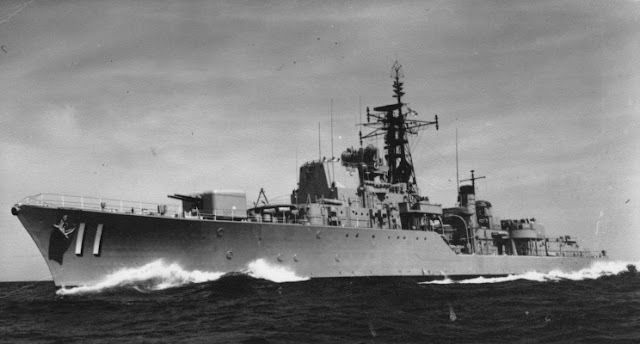 HMAS Vampire. One of four Daring-class (1949) destroyers ordered from Australian yards; of which three were completed. Very high tech for the time: Type 275 radar controlling a blind-fire director, STAAG stabilised tachymetric mountings for the Bofors; high pressure steam boilers; all-welded construction; AC electrics; Squid ASW mortar with associated "sword" rangefinding sonar. All the mod cons. It's really not clear to me whether someone, in the first week of February of 1947, was developing the idea that Australia might be a nuclear refuge for entire British industries, or not. The leading article in which I encountered the idea is easily the worst piece of journalistic writing I've ever encountered, and given The Economist's mid-century(?) habit of stringing out long thumb suckers on "worthy" subjects, that's saying a lot. The way the idea was broached, it might be someone reimagining a wartime conversation, a response to stories in the press, or even a serious effort to float the notion. The video gives a pretty vivid idea of what the weather was like, but it's a child's eye view, and doesn't really capture what came with the weather. Perhaps because the household had private access to coal? It most certainly wasn't weather to frolic in for some! honour of the season, I'm going to imagine a leader-writer, cold and hungry, working by candlelight (seriously! ), short of sleep from shivering in bed under a mound of shiny blankets and worn-out, piled overcoats. The idea of moving whole industrial sectors is a bit surreal, but it allows a brief fantasy of a warmer clime where a steak isn't a bit of gristly Argentinian leather. Although it has probably got a great deal more to do with the sterling balance than anything else. 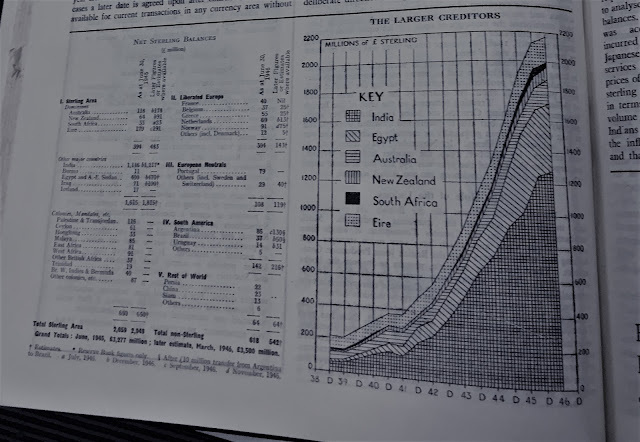 Canada, as a hard money country (as these things went in 1947), and as a larger economy, albeit one locked in never-ending sibling rivalry with Australia, went its own way. We had our shiny new British destroyer, but it was the prewar Canadian Tribals, not to be confused with the Pearson-era Iroquois class. Ever since, Canada has managed a new frigate (1,2) or destroyer about once a generation --so take that, Australia! I can't possibly comment on their value as mediums for technology transfer, except to note, that, in general, the Australians have done a great deal better on this front than Canada, with regular transfers of battlecruisers, cruisers, aircraft carriers to give Australia a look into the latest British maritime technology through the late 1950s. The Darings were something different, as they were built in Australia. To be sure, Australia has been building British aircraft designs for a decade now, but little does anyone reading optimistic blurbs about Fisherman's Bend in Flight know, that's almost at an end. Government Aircraft Factories will build licensed Sabres and Canberras, but otherwise mainly gets a look into foreign designs with a bit of subcontracting, whereas Canada is going to go on to have one of those classic, nationalist stab-in-the-back myths with the Arrow, and extract Bombardier from the wreckage. The Darings, meanwhile, really were at the cutting-edge of "information technology" in the late Forties. Was the decision to build a half-flotilla of the latest --and grotesquely oversized-- destroyers in Australia part of a plan to transfer an entire industrial sector to Australia? I don't see why not. Moving people by the hundreds of thousands is such a self-evidently Utopian project that you would want to go about it by half measures. I'm just not sure how far half-measures can get you, but at least they won't fail before they've had a half life that lasts through the 1950s, at least, with bomb tests at Woomera and contracts for TSR-2s, before whatever it was that happened, brought it all to an end. On the Beach? Apparently, Nevil Shute's publicist worked for the RAF, because the Brits put some cobalt in the Antler round hydrogen bomb tests at the Maralinga Range, Australia. I'm not privy (because I'm lazy) to the Australian national response to Kubrick's warm-up for Dr. Strangelove, but I cannot imagine that rumours accusing the British of actually trying to develop a cobalt bomb helped very much, even as the actual tests not only managed to expose some participants to Co-60, but also showed that cobalt bombs were impractical, as most of the slow neutrons were absorbed by other cobalt isotopes. I suppose that it could have been worse, that the British could have gone on to test nuclear rockets, with a resulting terrible launchpad accident. So that's the Australian story. Basically, an opportunity to remind us of just how technologically challenging ship-based anti-aircraft fire control was in the late Forties. And a reminder that people were weird back in the Cold War. Speaking of the Cold War! 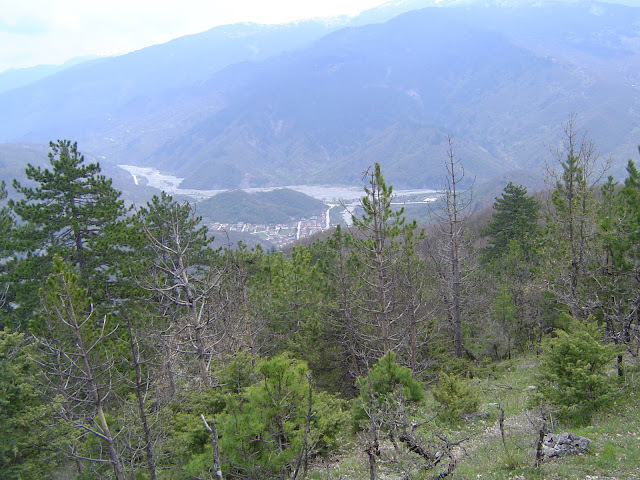 So here is a battlefield of the Cold War, where, in the cold and hungry years of the late Forties, Greek Communist and Government forces clashed for control of the high slopes of the Pindar Mountains, near to Dodona, where Zeus the Counsellor once spoke in the rustling of an oak tree grove. Besides the fact that I like the photo, the point I'm trying to make is that it is a bit strange that a communist insurgency would take to the hills. It's not a very good point, considering that Mao and Tito have both been down this road already, the final, universal revolution is supposed to spread from the factories to the streets, and the earliest phases of the Greek Civil War did involve urban unrest in Athens. It probably doesn't take very much more than the British intervention to explain why the "final battle" wasn't fought in the streets, while nationalist issues and the success of partisan Communist movements in Yugoslavia and Albania account for the long continuation of The Greek Civil War along the northern borders. But Arcadia? The conventional explanation is that the ELAS fighters up under the oak trees of Arcadia were working-class fighters and union organisers from downtown Athens. I don't think that this is wrong, considering that the population of the 4000 square kilometer region of Arcadia has been collapsing throughout the last century, and is now down to 87,000. If Mao's guerillas swam in the sea of the people, the fighters of the Revolution had a fish pond, at best. 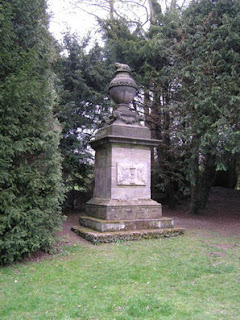 "Et in Arcadia, jeez those Holy Blood and Holy Grail guys owe me a lot of back rent for mind share." That being said, militant Marxist vanguard parties don't usually look to backcountry hicks for support. They do embrace "peasants," if more in theory than in practice, but that's usually the rural working class on factory farms. However, when they go out into the sticks, I'm told that they shoot mayors and priests and terrorise the sturdy sons of the soil. 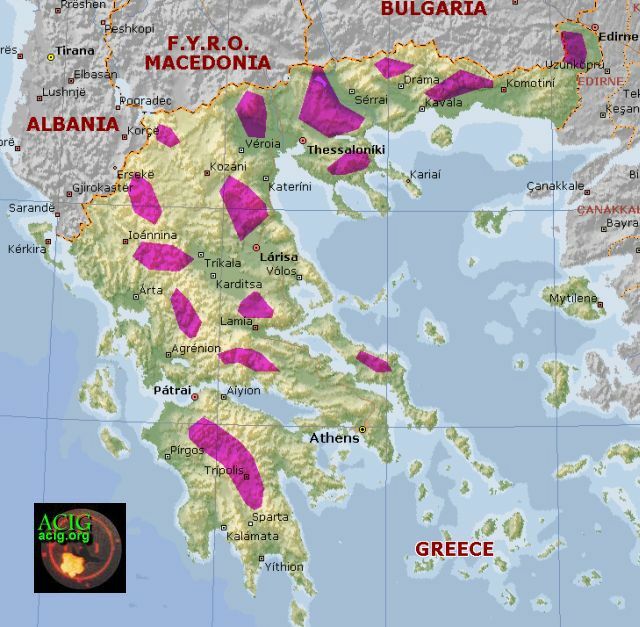 I live in Kitsilano, so I'm pretty sure I would have heard about that if it had happened; and, as a matter of fact, the conventional history of the Greek Civil War in the Peloponnese is that the ELAS/KKE fighters had considerable local sympathy. The ideas of outgoing depopulation and incoming Marxist revolutionaries obviously aren't incompatible. If the revolutionaries were Arcadian emigres in the first place, their local support and ability to wage a guerilla war in the first place is explained. I just think that this opens up an additional dimension to the problem. After all, narratives of collaboration and political division aside, the dominating story of Greece in the war years was of a brutal subsistence crisis, as Greece was cut off from its traditional grain imports. In other European countries, and notably in eastern Europe in the later years of WWI, the underemployed, underfed urban proletariat responded, reasonably enough, by going home to the country to practice subsistence farming. Italy, Greece, what's the difference? They're both penninsular Mediterranean countries. "Shipping gangs" should probably read "Shipping gains/"
The problem with subsistence farming is that it doesn't pay for imports. Without exports, Greece can't pay for coal, and without coal, it is not going to have industry at all. 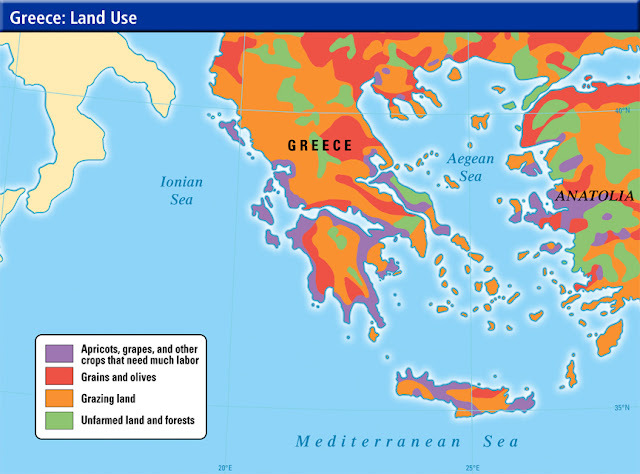 The Greek diplomats arguing for a twenty year monopoly on German tobacco as their price for peace, have a point, in that it will allow Greece to generate foreign exchange from their downland arable, in the same way that Greek elites are always trying to turn the flat, marshy sea-level land of the Mediterranean littoral to account. They're wrong, of course; it is going to be ship-owning that does the trick (alongside tourism, but I think we can just go ahead and assume substantial tourism revenues in the Greek case), but they're trying.
. The Knossos palace monitored 100,000 sheep, primarily wethers for optimal wool production since castration provides more homogeneous fleeces. Other flocks of sheep grouped female animals and their lambs. Some 700 shepherds tended these flocks throughout central and western Crete. In the villages, and around the palace of Knossos, ca. 1000 women and children were occupied with a wide range of tasks related to textile production, primarily wool. We know this, thanks to the so-called Linear B inscriptions, an ancient syllabic form of Greek, and an astonishing source for the ancient wool economy.2 Wool textiles are recorded by logograms, and in large numbers. Each year the Mycenaean flocks provided ca. 50-75 tons of raw wool; after cleaning this amounted to 25-40 tons for textile production. Mycenaeans use logograms to designate a piece of textile, and each of these pieces are woven from 1-10 kilograms of clean wool. Thus the annual yield of raw wool would provide fiber resources for between 2500 and 25,000 textiles. Transcription [of Tablet KN Dl(1) 930, written by scribe 118]: po-ti-ni-ja-we-jo OVISƒ 50 LANA 3 M [ ]ma-di-qo /si-ja-du-we o ki OVISm 50 o LANA 6 M 2[ Translation: Ma-di-qo (shepherd’s name), at Si-ja-du-we (place name), under the goddess Potnia (po-ti-ni-ja-we-jo): 50 ewes (logogram OVISƒ ) (yielding) 10+ kilos of wool; 50 lambs (ki OVISm) and 20+ kilos wool are missing. The average expected production of a wool sheep is between 4 and 18lbs, depending on breed and wool quality. That's somewhere between four and ten times LBA production. The difference is between the basically Neolithic industry of combing and plucking, and shearing practice. We don't know when iron shears were introduced into the industry, apart from "sometime in the Iron Age," so we cannot imagine a day when the overseer came around and gave the palace women of Knossos their pink slips, because Egypt had gone to shearing and no longer needed wool imports; but this is certainly an additional dimension to the Late Bronze Age collapse! 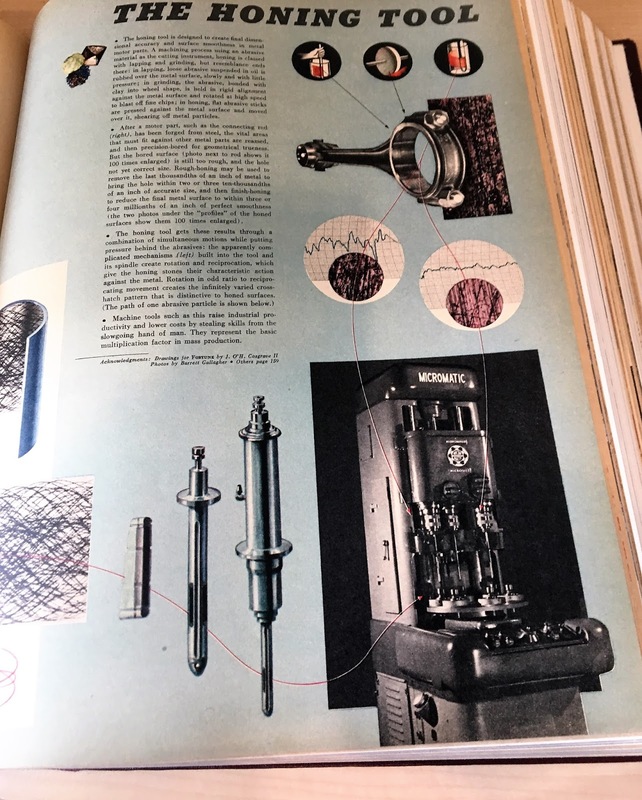 The next stop in this potpourri of relevant stories from 1947 is the saga of Micromatic Hone. Fortune seems to have as much as there is to the story. In the late 1920s, a Detroit engineer named Fred Jaschke came up with the idea of turning the standard grinding wheel into a form-fitting tool tip, thereby inventing the machining process known as "honing." Lapmaster Wolters shows us the three original uses of honing. It was also developed subsequently for modifying flat surfaces. That leaves Micromatic Hone where Fortune comes in, as the firm that used to operate in the former canned-bean-sprout factory operated by the Chinese food supplier with no Chinese principals. This was, and is, a great story, since the factory is still there to be seen in Detroit, long after La Choy moved out, and Micromatic went to that big industry directory in the sky. Though if I were to investigate the history of La Choy Foods, I'd be looking for a Chinese silent partner. I'm not saying that there was one, but I have a hard time imagining a firm run entirely by white guys selling into Chinese restaurants. . . . This was, and is, a great story, since the factory is still there to be seen in Detroit, long after La Choy moved out, and Micromatic went to that big industry directory in the sky. So it's sad that Micromatic Hone has disappeared so completely, but as a maker of one-off, specialised machine tools, it had little inherent first mover's advantage apart from a skilled labour force and patents that would have expired in the 1950s. Fortune itself implicitly predicted its fate. Once the patents had expired, and new ownership was in place, the automobile makers had precious little reason to be loyal to a monopoly supplier. So what about the patents? It turns out that the story that Fortune tells in connection with the Jackson dissent is a little off from the history of patent law as it is taught. The received version also starts the age of Great Darkness with the Sherman Antitrust Act, which launched a benighted era in which obscurantist Progressives vaunted their pretended belief that patents were more about imposing rents on industry than sacred innovation. The darkness gets no more dark with Warren Douglas' "spark of genius" decision; although, curiously, the modern era of patent law is said to begin with a 1952 Act of Congress that specifically set it aside. Still, the outlines of the story survive. It turns out, much to the shock of this historian of technology, that it has always been taught, within American patent law, that the role and importance of the patent varies from election to election. American patents were awarded by priority of discovery, not filing, in case you were wondering about cases in which patents were awarded on the basis of stories about unwitnessed experiments and lost prototypes. 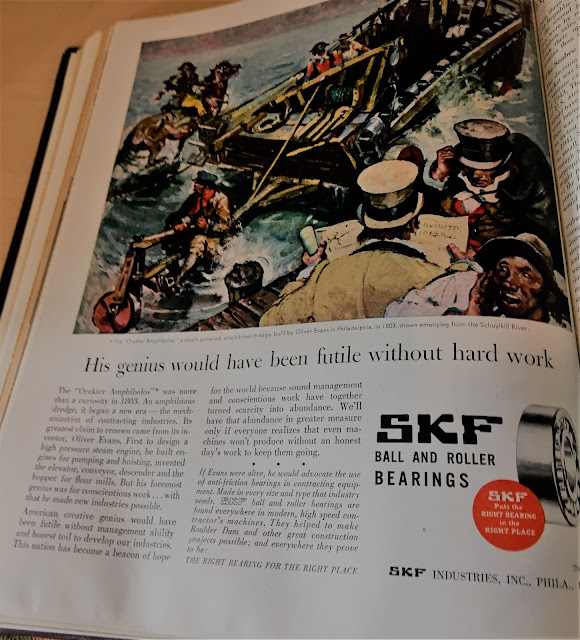 . .
You might have to squint a bit, but SKF is telling us that one Oliver Evans was the "first to design a high pressure steam engine," This claim doesn't seem particularly well-founded. He was the first American to build a high-pressure steam engine, but his engine post-dated the world's first, by Richard Trevithick, but Trevithick's engine wasn't really the first, since Trevithick knew William Murdoch's work with "strong steam," which goes back to 1784, and itself may have been inspired by French work. The "first to design" gets around Trevithick's priority, but not Murdoch's. It is, in any event, more common to get an American credit for high pressure steam by reference to John Fitch, who drummed up some patents from the Continental Congress, ran excursions on the Delaware in the summer of 1790 in an (alleged)* steamboat called the Perseverance, and, then, and this is the important part, tried to build on this experience to claim an American patent for the steamboat from the brand-new federal government in 1792. With Fitch before him alongside James Rumsey, Nathan Reeds and John Stevens, all filing for broad American patents, the new President, one Geo. Washington, a former military man, quickly determined that he didn't have time for this crap. The new "Don't let drunken con artists bug the President" version of the Patent law passed in 1793, handing off the responsibility to the Secretary of State who, in turn, passed the buck down to some clerks in a "loosely organised" patent office. By 1836, they had granted 10,000 patents, as "loosely organised" as the office itself, and it was not entirely to the disadvantage of the United States that, promptly after the passage of the Patent Law of 1836, the original patent office caught fire, leaving only 2,845 patents surviving. That doesn't take this appendix back around to the building of the Australian Darings, but you can maybe see a parallel if you squint, and since it is Saturday afternoon and I've been up since 6PM last night (stupid night shift rotation), I'm going to call it a day. Or night. Whatever. *It would be irresponsible not to speculate, as the cool kids say on the interwebs. [pdf that establishes that Fitch's rivals thought that he was a fraud, although of course they would] If you're a little lost at where "high pressure steam" comes in, it's assumed that Fitch's engine was high-pressure, because it wouldn't have worked, otherwise. I'm assuming that it didn't work at all, given the scale of the engineering challenges he faced, and the mysterious disappearance of the Perseverance and that the actual motive power was a gang of rowers hidden in the gunwales, but I'm a cynic, and you shouldn't pay any attention to me. Meanwhile, isn't the point about the Greek civil war dead simple? They presumably reactivated (or didn't ever deactivate) the hide areas they used against the Germans.